Natural geysers form when underground chambers fill with water and are heated geothermally. When the water is heated to its boiling point, the geyser erupts, spewing its contents—and the cycle starts again. Cut the 2-liter bottle in half. Save the top portion for this activity and discard or reserve the rest for another use. Position an unplugged hot plate next to the base of a ring stand. 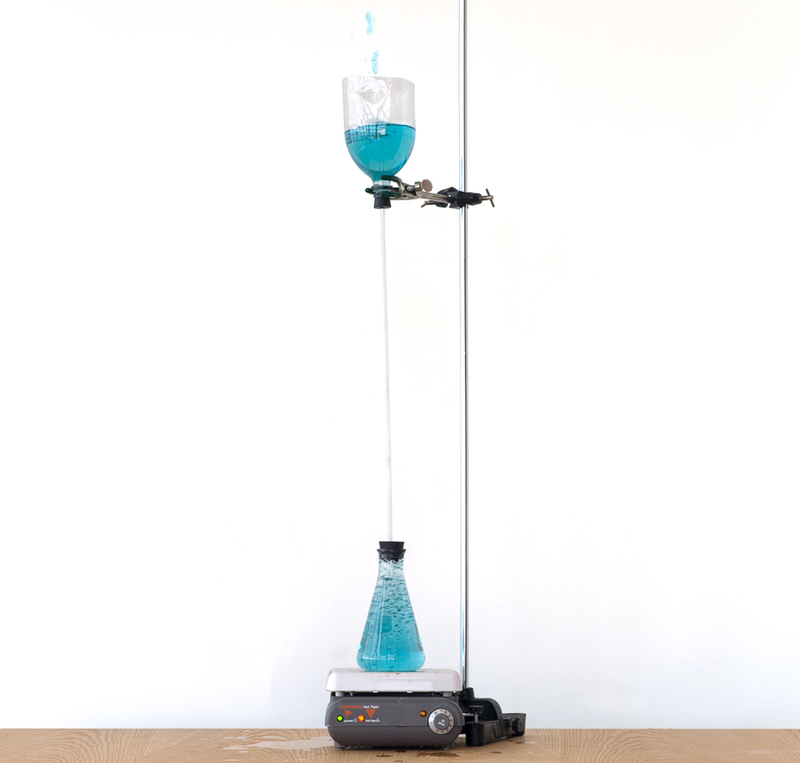 Fill the Erlenmeyer flask to the top with water and set it on top of the heating unit. Cap the flask with the appropriate end of the assembled stopper and glass tubing. Slide a metal ring or Burette/retort clamp onto the upper portion of the ring stand (don't tighten it yet). Position it above the top of the glass tubing. Invert the top half of your cut 2-liter bottle so that the mouth of the bottle is pointed downward. Insert the upper end of the glass tubing and stopper into the bottle's mouth. Next, use the metal ring or clamp to secure the upper portion of your bottle apparatus. Note: the upper portion of your assembly needs to be well supported. Pour cool water into the inverted top portion of the 2-liter plastic bottle. Fill the container with enough water so that the top of the glass tubing is a centimeter or two below the water's surface. Add one or two drops of food coloring if you wish. Put your goggles on, turn on the heating element, and stand back. (It might take a while for your geyser to blow the first time—be patient.) From a safe distance, watch what happens as the water heats and boils. After your geyser "blows," it will reset itself by drawing the cool water from the inverted bottle back into the flask. Several eruptions will occur before the water in the plastic bottle gets too hot and the temperature difference between the water in the flask and the water in the plastic bottle is not great enough to refill the system. When this happens, turn off or unplug the heating element and wait until the water in the plastic container cools. Note: It might take a few tries to find the right temperature to make the geyser blow in a repeatable cycle—too much heat and the flask will not refill; too little and the geyser will not erupt. How many different cycles can your geyser go through? Use your stopwatch to time and record the duration between eruptions and any other cycles you observe. There are three main phases to this geyser's cycle: heating, erupting, and refilling. The heating time required to cause an eruption is based on two main factors: The energy output of the heat source and the length of the glass tubing. The longer the glass tube, the more pressure there is on the flask of water. The more pressure there is, the more heat is needed for the water to boil and the longer it takes for the geyser to erupt. Steam expands to over 1,700 times its volume as liquid water. (As the steam bubbles and liquid begins to rise up the tube, it reduces the pressure in the chamber below. This in turn reduces the boiling point of the water, causing a rapid conversion of liquid into steam). That's what causes the eruption you see, and launches the water out of the geyser. After the eruption slows, a small amount of cool water in the upper container will flow down into the flask, causing the steam in the tube and flask to condense. This decreases the pressure inside the apparatus, allowing the atmosphere outside to push more water down into the flask, refilling it. Yellowstone National Park in northwestern Wyoming contains approximately 400 of the world's 700 geysers. Steamboat Geyser, located in Yellowstone's Norris Basin, is currently the world's tallest erupting geyser. Major eruptions can be over 350 feet tall. Create clouds in a bottle by rapidly expanding the air. The timing of the eruptions of these geysers depends on water temperature and pressure.